So wrote Ridge Riley ’32 in The Football Letter the week after Penn State’s 1963 visit to Ohio Stadium, a 10-7 Nittany Lion victory over the Woody Hayes-coached Buckeyes. It was just the third meeting between the big state schools—all of them in Columbus—since the sporadically played series began in 1912. And for whatever low expectations folks in central Ohio—”the Football Capital,” as Ridge Riley wrote with what we imagine was tongue firmly in cheek—had for the visiting Lions in the fall of ’63, Penn State had won on each of its previous visits to the Horseshoe. They won that time, too. Much has changed in the 50 years since. Of course, Ohio State is still one of the nation’s elite programs, unbeaten as the Lions head back to Columbus this weekend for the 29th meeting between these now-Big Ten rivals. The Buckeyes lead the all-time series, 15-13, having tipped the scales westward since Penn State joined the conference. 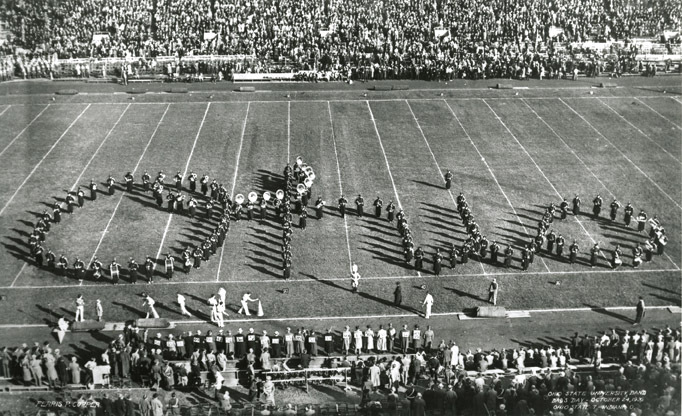 The Lions were 6-2 against OSU in eight meetings between 1912 and 1980, including a rather remarkable 5-1 record in Ohio Stadium and a 31-19 win in the 1980 Fiesta Bowl. The two teams didn’t meet again until Penn State opened Big Ten play in 1993, with the Buckeyes boasting a 13-7 advantage since. Ohio State enters Saturday’s contest with a 19-game winning streak, a run that includes a 35-23 win in Beaver Stadium last fall. The Buckeyes are favored, of course, but we imagine most OSU fans know better than to write off Penn State’s chances: In two of their last three trips to Columbus, the Lions have come home victorious. This entry was posted in From the Archives and tagged Ohio Stadium, Ohio State, Ridge Riley, Woody Hayes. Bookmark the permalink. Do not forget the 1956 game that ended with Penn State punting the ball. It was a very long punt. I think It landed on the 2-yard line. Time ran out on Ohio, and Penn state won with a very small margin. the campus went wild that night with cars drivinhg up and down the mall, Only the administration thought the mall was supposed to be closed to Auto traffic. That’s great stuff, John. Thanks for sharing a terrific memory — one we’ll get to in a future post.